Adequate Storage Space: 9 cubes are available for storage. You can store all sort of items as you want: books, clothes, toys, artworks, decorations and more. The size of each cube is 11.8x 11.8x11.8 inch, providing large space to hold more things. Please note: it fits storage bin that is smaller than 11.5*11.5 inch. DIY Your Ideal Shape: There are 9 cubes provided, you can create the storage organizer in varieties of shapes to meet your needs. Besides, it can be freely adjusted due to the limited space to fit in. Various Function: This cube storage can be used in many places: a collection shelf in your study room, a clothes organizer in your bedroom, a display shelf in entryway, and a toy storage solution in kids room. Easy to Install: Simple modular structure makes it easy to install and disassemble. With the help of a hammer (included in the package) and the instruction, you can easily assemble the whole unit. Warranty: We will provide 45 days Money Back Guarantee and 12 Months Warranty. If you have any issue, please contact us, We have a professional team to solve your problem. Purchase with worry free. Specifications: - Color: Translucent - Material: PP plastic sheet, ABS connector, iron wire - Overall Size: 49. 2"L x 12 . 2"W x 48. 4"H (123 x 31 x 123cm) - Load Capacity: 10lbs (4. 54kg)/Cube Package Contents: - 56 x PP Plastic Sheets - 52 x ABS Connectors - 1 x Rubber Hammer - 1 x Instructions - 2 x Anti-Toppling Fittings Notes: 1. To ensure a longer lifespan of this product, please avoid abrupt forces or placing sharp items inside. Keep it away from heat sources. 2. Please make sure all the round side of the connectors marked with 'Songmics' face outward during assembly. 3. Insert the iron wires all the way to the end of each groove during assembly. Please make sure all the ABS connectors are secured firmly. 4. It is not recommended to place heavy stuff (e. g. books, dumbbell, etc. ) inside the cubes. BS-285-340-320-CR Color: Cedar Pictured in Cedar Features: -Cube.-Simple, versatile storage cube offers multiple decor and furnishing options.-Made of durable, zBoard recycled paperboard; responsibly sustainable design.-Sustainably made, non-toxic, no formaldehyde and no VOC for a healthy home.-water resistant. Includes: -Backer board included. Options: -Available in Cedar, Espresso, White, Black, Blue, Orange, Green or Pink colors. Assembly Instructions: -World's easiest tool free assembly. Warranty: -Manufacturer provides 1 year warranty. Specifications: - Color: White- Material: Powder Coated Iron Meshes, ABS Connectors- Product Size: 34. 3 L x 12. 6 W x 21. 3 H (87 x 32 x 54cm) - Weight: 11lbs (5. 0kg) - The Max. 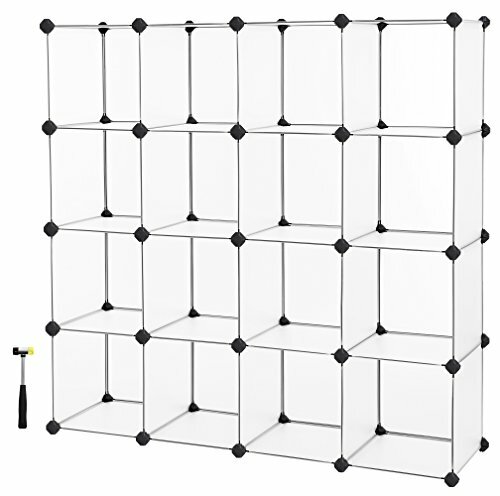 Load Capacity of Each Cube: 33lbs (15kg) Package Contents: - 8 x White metal meshes (16. 5 x 12. 2 ) - 6 x White metal meshes (16. 5 x 6. 7 ) - 9 x White metal meshes (12. 2 x 6. 7 ) - 24 x White ABS plastic connectors- 1 x Rubber mallet (0. 385lbs) - 2 x Anti-toppling fittings- 1 x Instruction SONGMICS Notes: - Do not place the item outdoors for extended periods of time to avoid weathering. - Keep round edge with SONGMICS logo of plastic connectors facing outward during assembly. - All mesh sheets should be pressed to the bottom during assembly, after each layer is finished, firmly press each connector to make sure the wire corner reaches the bottom with no gap to add firmness. 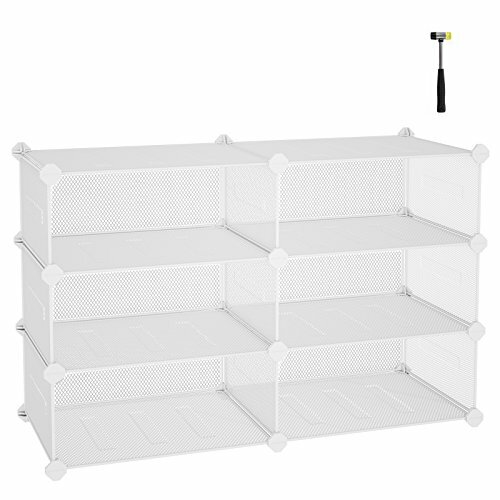 HEAVY-DUTY & EASY TO ASSEMBLE: Made of dense metal mesh shelves & ABS plastic connecter (when installation all you have to do is to use plastic connecters to make tight joints for a reinforced interlocking structure), included anti-toppling fittings prevent unit from tipping over included. 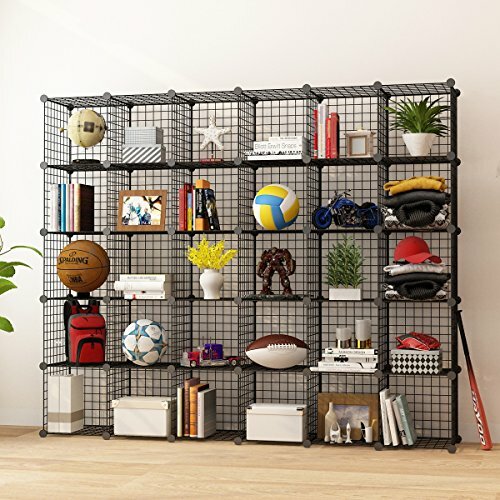 The industrial look of this 16 cube wire grid shelving rack perfectly fits modern apartments, studios or office spaces. With a capacity of 44lbs. per cube, you will be able to fit your books, decoration items, shoes, clothes, electronic accessories, all your bedding, bathroom necessities, towels and more. The open rack allows for great ventilation and excellent airflow and it is the perfect storage system to have everything perfectly organize within a small space. 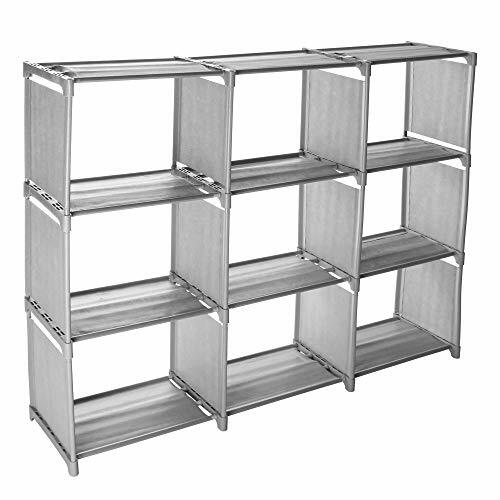 Beyond the modern industrial look of this multiuse bookcase, this modular rack's best feature is its adaptability to the environment. You can build the cubes together to create a big cabinet, or you can build them in several blocks if you want to put them on different spaces. 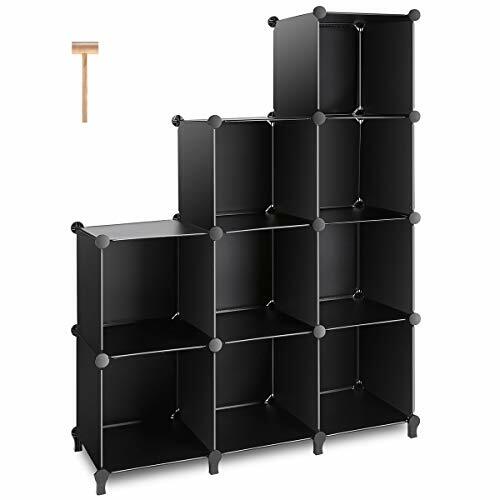 With the black ABS connectors, it will be very easy to put the pieces together and to take them apart whenever you want to change the disposition of this wire grid modular bookcase. The package includes the panels and the plastic connectors to put together the unit. We recommend to use a pair of gloves while assembling the unit in order to prevent you from getting scratched. All dimensions are measured manually with a possible deviation of 1-2 cm. A rubber mallet (not included) may be needed to tap connectors into place or if panels are hard to line up. Weight capacity per cube: 44 lbs. Locking Storage Container Bin - Safety & Security Storage Box (37 Gal. Capacity) Features: Convenient Storage Box Solution Integrated Combination Lock for Security User-Defined Number Pass Code Setting Safe, Rugged, Reliable Construction Heavy-Duty Impact Resistance Anti-Scratch & Stain-Resistant Housing Easy Access Lift-Top Hinges Clean & Streamline Modern Style Side Panel Carry Handle Grips Perfect for Home, Office, School, Business & Mobile Use Technical Specs: Internal Storage Capacity: 37 Gallon/140 Liter Maximum Support Weight: 130+ lbs. 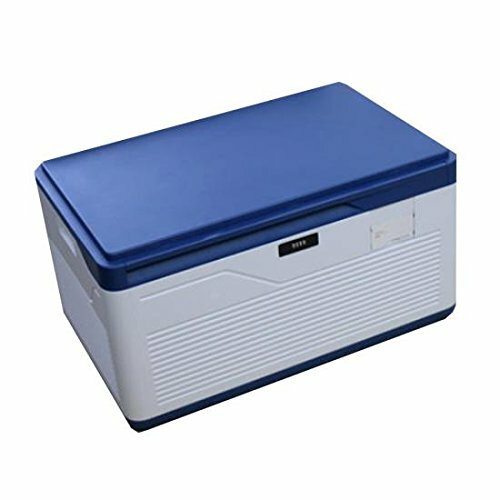 Construction Material: Reinforced Engineered ABS Pass Code Type: Manual 4-Digit, Numerical Dimensions: 11.5'' x 18.5'' x 29.0'' Here s a great way to organize your closet, storage room, garage or basement so you can have that extra space you need SereneLife SLSBIN30 Locking Storage Containers. Unlike regular tote box or plastic storage bins with lids, this storage solution is made from heavy duty materials. 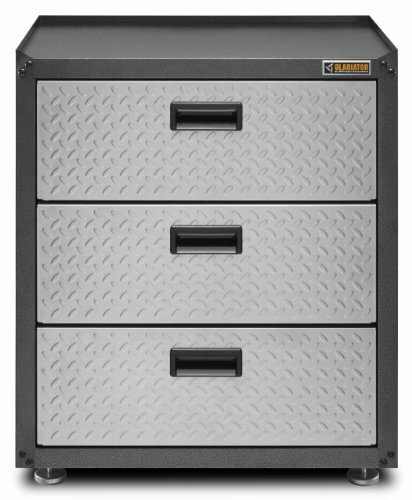 Perfect for storing clothing, paperwork, tool and accessories, or just anything else you can think of. If you want a durable storage container boxes with innovative design that allows secure stacking as well as a resettable combination locking mechanism for added security, then look no more. We ve got you covered! 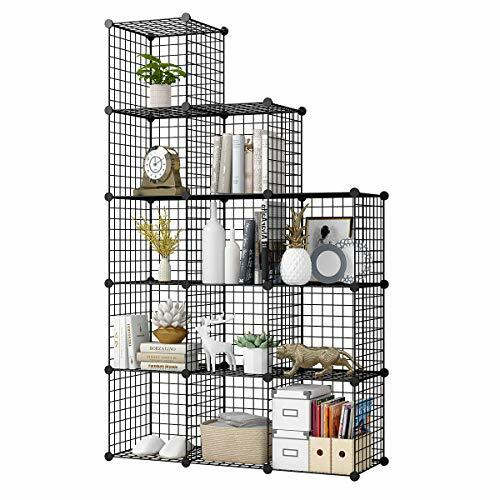 today deals MULTI-FUNCTION STORAGE From books, toys, pantry items, folded clothes, shoes, art supplies, fabrics to anything you can think of.KOUSI Wire Cube Standing Shelf Units meet all your storage and display needs. STRONG & STURDY DESIGN Each cube supports up to 44 lbs. The high quality coated steel makes construction more than reliable. CUSTOMIZE ORGANIZER USAGE Individual panels can be used for wall decoration , pet playpen and many other things. Be as creative as you can! HIGH CAPACITY STORAGE Each cube measures 14 x 14 x 14, with a volume of over 1.6 cubic feet which creates extra room in your space.85''W x 14''D x 72''H / 210cm(W) x 36cm(D) x 180cm(H).Large capacity to meet your different storage needs. QUICK & EASY ASSEMBLY Tool-Free assembly in a brief time with detailed installation manual and video from KOUSI. Color may be little different due to monitor, thanks for your understanding. 李李A Perfect Gift! Necklace in a surprise for your family and friends! Name Necklace is delivered with a Velvet bag .It's a perfect gift for for any woman in your life. This beautiful crafted initial Name necklace is the ideal gift for your best friend, daughter, wife, mom, and even grandmas love them too,Which is very Memorable!  Its Love Meaning Large Initial Necklace is a good Necklace Gift let her know she's always the most important one in your heart like these Letter Name. When she wears this necklace she'll have a reminder of her strength and that you are always there for her. 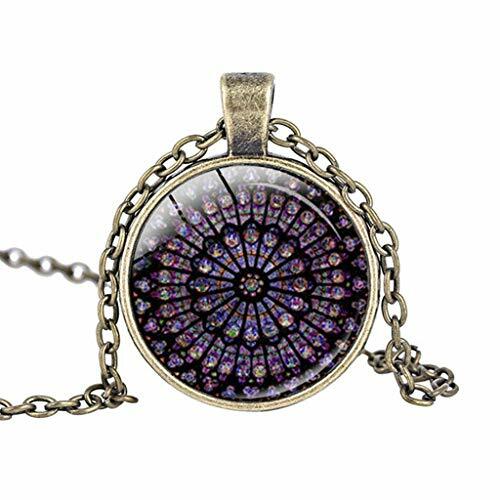 Celebrating family, wife, daughter, granddaughter, women, and girls, Mother, Friends, Let her know you'll love them forever with this elegant pendant.  Color may be little different due to monitor, thanks for your understanding. HIGH CAPACITY STORAGE Each cube measures 14 x 14 x 14, with a volume of over 1.6 cubic feet which creates extra room in your space.57''W x 14''D x 72''H / 145cm(W) x 36cm(D) x 180cm(H).Large capacity to meet your different storage needs. It is an ideal choice for you to make your work places or home more organized with colorful 20-drawer rolling cart . 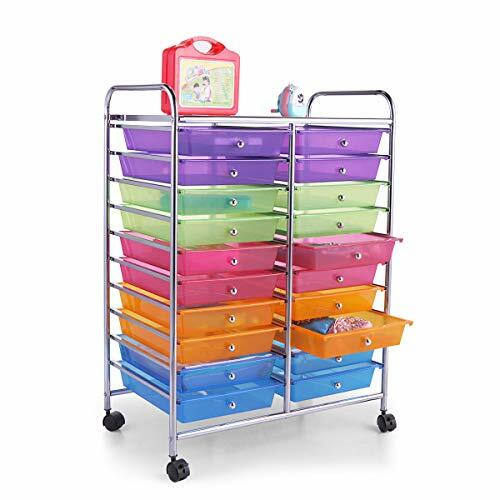 This double-line organizer features 20 easy-access & removable drawers, which provide ample space for you to store stuff by different categories. Side Chute Length: 15 "
Shipping & Customer Service, Good News: The Expedited Shipping Fee is free. Please choose Expedited Shipping,you can get the item within 3-5 Days.Any question, please feel free to contact us.Thanks. Easy to assemble: The wardrobe rack is easy to assemble and does not require any tools..The shelf slides over the top of the clip, keeping it in place, allowing you to choose your own shelf height. For your safety, it is recommended to ensure that the shelves are flipped correctly so that they are fully attached and covered with plastic clips. 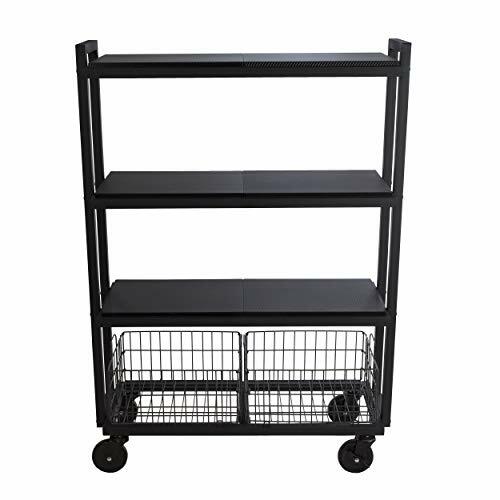 Large capacity: This cube storage rack, with 9 cube openings, is a wardrobe.Made of high quality thick steel pipe and plastic connector, the storage cube frame has a solid and stable structure. Waterproof, easy to clean: thick film non-woven fabric, moisture-proof and breathable, easy to clean, durable. Great for Storage, This Multi-function shelf can be used anywhere you like such as bathroom, kids room, office, kitchen, hair salon, art studio and so on. 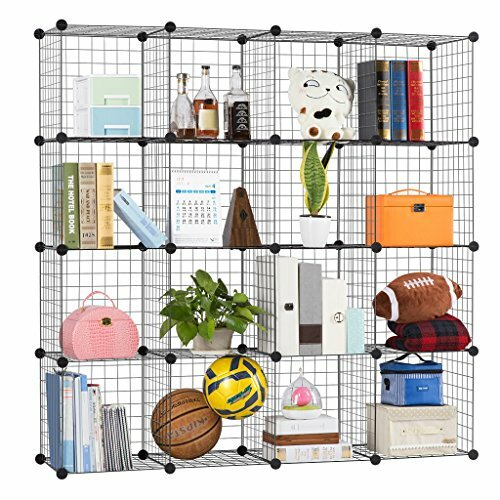 perfect for storing shoes, books, clothes, this cube organizer can be used as a bookshelf, shoe rack, wardrobe, toy cabinet or display stand. The Transformable 4 Tier Cart System provides efficient mobile storage for use in the kitchen, office, garage or outdoors. Whether you are entertaining or just need extra storage, you can interchange shelves and baskets to suit your needs. The high quality steel frame is built for years of use. Specifications:- Color: Black- material: PP plastic sheets with metal wire frame, ABS plastic connector>- product size: 36.6 L x 12.2 W x 36.6 H (93 x 31 x 93cm)- size of individual plastic sheet: 11.8 x 11.8 (30 x 30cm)- weight: 12lbs (5.45Kg)- the Max. 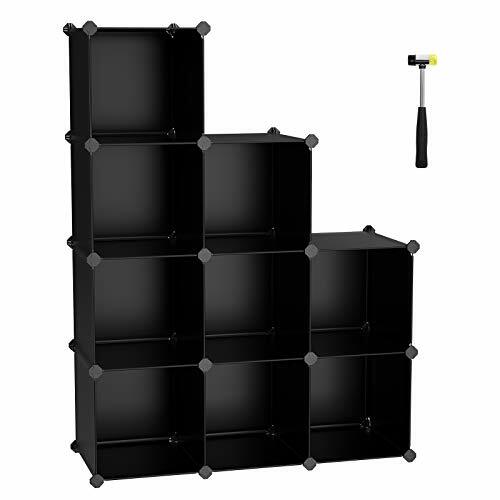 Load capacity of each cube: 10lbs (4.54Kg)package contents:- 34 x Black plastic sheets (11.8 x 11.8 )- 34 x Black ABS plastic connector>- 1 x Rubber mallet (0.385Lbs)- 2 x anti-toppling fittings- 1 x instruction (polypropylene, de, FR, features, it)songmics notes:- do not place the item outdoors for extended periods of time to avoid weathering.- keep round edge with SONGMICS logo of plastic connectors facing outward during assembly.- all plastic sheets should be pressed To the bottom during assembly, after each layer is finished, firmly press each connector to make sure the wire corner reaches the bottom With no gap to add firmness. 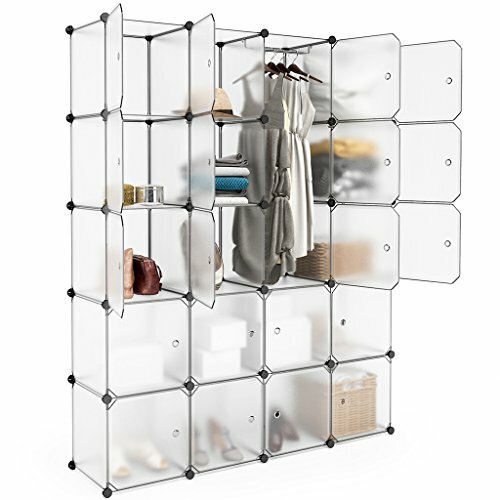 this 20-multiposition cubes organizing closet is perfect for a modern home. You could either build the cubes together to form an entire closet, or separate them into a couple of matching shelving units. This is a perfect idea for rooms with a smaller surface, combine the panels depending on your needs and thanks to its light color, it will create an optical effect that will make a small room seem bigger than it actually is! We take very seriously the environment, this is why we always create new pieces of furniture respecting Mother Nature. The panels of this unit are free of harmful chemicals like formaldehyde to ensure that you and your beloved ones live in a healthy and non-toxic environment. Keep your Space Tidy up! Add style and storage to any room with this new LANGRIA Shelving System. Ideal for any living room, bedroom, or small space like a crowded small dorm room. This shelving provides ample space to store toys, blankets, clothing, shoes and other small items to keep them tidy and organize. Say goodbye to clothes and toys scattered all over the room! Weight Capacity per Cube: 10 lbs. Please Noted: Each panel might slightly bend when loaded but it's a normal phenomenon. DURABLE MATERIALS: the cubes use steel frames to keep the structure solid and stable, each plastic cube holds up to 22 lbs. 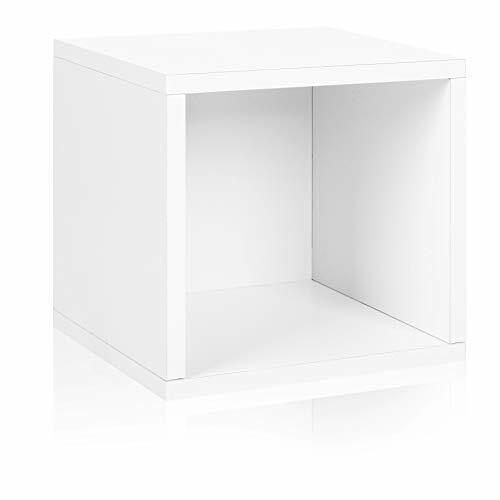 Way Basics Eco Modern Storage Cube - White The Cube is 100% , 100% non toxic, and 100% you! You'll find dozens of uses for your Cube. It'll be a cubby to store toys, figurines, magazines, DVDs or books in. Assembly is as easy as peel, stick, done! With no tools or hardware required for assembly, carefully placed strips of industrial strength adhesive give the Cube its super strength and allow it to be completely non toxic! Ideal for everyday life in the playroom or any living space, the Cube is the first building block for creating your own customized furniture ideas. Building storage solutions into your child's life has never been so practical, affordable and easy! Way Basics zBoards are made from recycled paperboard and are formaldehyde free and non toxic. Safe for our families and environment. - Outside: Depth 11.3 / Width 13.4 / Height 12.6 - Inside: Depth 11.2 / Width 11.5 / Height 11.2 What makes Way Basics different: Way Basics modular storage is built out of zBoard. zBoards products are made from zBoard recycled (99% post-consumer recycled paper) paperboard. zBoards can be completely recycled, are formaldehyde and VOC free, and are 62% lighter than particle board. Best of all, no tools are required for assembly; super strong adhesive tape (included) is all that is needed to create stylish storage that suits your lifestyle. Warranty: Way basics warrants that the products will, for a period of one year from the date of shipment of such products to you, be free from defects in material and workmanship under normal use and conditions. We agree to repair or replace without charge for labor or materials, all defective products which is returned for inspection to the above center within the applicable warranty period, and with the original receipt, provided that the inspection discloses that the product has (i) not been altered or repaired other than by way basics personnel, (ii) not been subject to misuse, improper maintenance, negligence, improper handling, inadequate packaging or accident, or (iii) not been subject to misapplication of the product instructions for assembly, use or care, which is included in the delivered package. Those replaced or repaired parts supplied by way basics under warranty are excluded from this warranty, and the product, including any replaced and/or repaired parts, will be covered for the unexpired portion of the original warranty. All defective items or parts that we replace shall become the property of way basics.